You shall not wrong a resident alien . . . – Ye watchers and ye holy ones . . .
You shall not wrong or oppress a resident alien, for you were aliens in the land of Egypt. Exodus 22:21. According to family stories, some of my ancestors on my mother’s side came to this country with Peter Stuyvesant who founded New York. A descendant of that early colony eventually moved from New Jersey to Columbus, Georgia, where he married my great-great grandmother. I have no idea how her family got here, but I assume all of my ancestors were immigrants who came to this country seeking peace and opportunity. 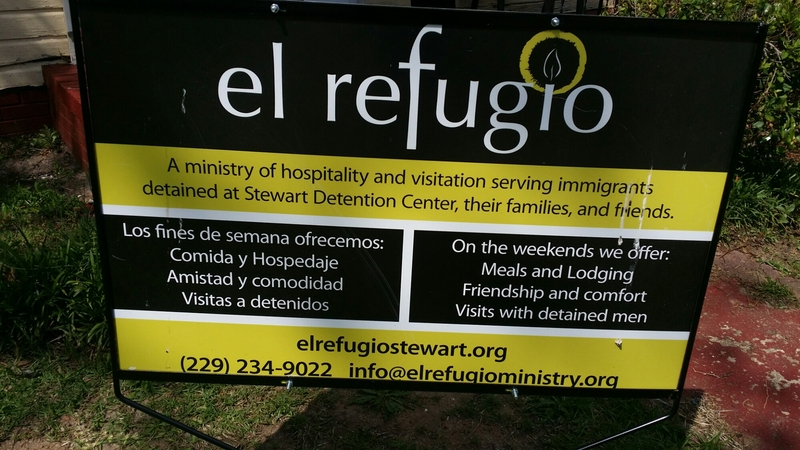 I thought about my ancestors as I visited this week with a man at Stewart Detention Center in Lumpkin, Georgia. He was born in a North African country. He came to the US on a visa as a dancer. He danced with several dance groups and got invitations to keep dancing. He didn’t have the money to return home, so he overstayed his visa. He was taken into ICE custody (Immigration Customs Enforcement) and sent to Stewart. He has been there about two months. He assumes he will be deported eventually. Stewart is one of many for-profit prisons operated by Corrections Corporation of America. The website is here. CCA is a big money operation. I was told 2015 Revenue was $1,793,087,000 with net income of $ 221,854,000. Stewart was built in 2006 by CCA as a medium security facility. The immigrant detention work came there in 2008. Detainees (all men) come from many parts of the US. A few were arrested for felonies and completed sentences for those crimes before being sent here. Some were taken into custody as soon as they entered the US. Many of those folks fled war and violence in their own country. They came seeking asylum, but were taken into custody before they could make the asylum claim. Some, like the man I visited, entered legally but overstayed their visa. Once they arrive at Stewart, they will likely stay months or years as their case winds its way through overbooked immigration courts. All of this costs money, of course. Tax payers pay big money to lock up these people, most of whom pose no threat. Some of these men have a valid case and may not be deported. Some are waiting on the U.S. to review their legitimate petitions to immigrate but the wait takes years, and the men cannot survive in their home countries while they wait for the U.S. to review their case, so they end up at Stewart while they are waiting. And once they are incarcerated, the money continues to flow. Detainees are hired for jobs within the prison. They are paid well below minimum wage for jobs that could go to people in the community who need work, but paying low wages to detainees increases profits. The money detainees earn from these low wage jobs can only be used in the prison commissary, which increases profits. Rather than love the alien, this system profits from the alien. 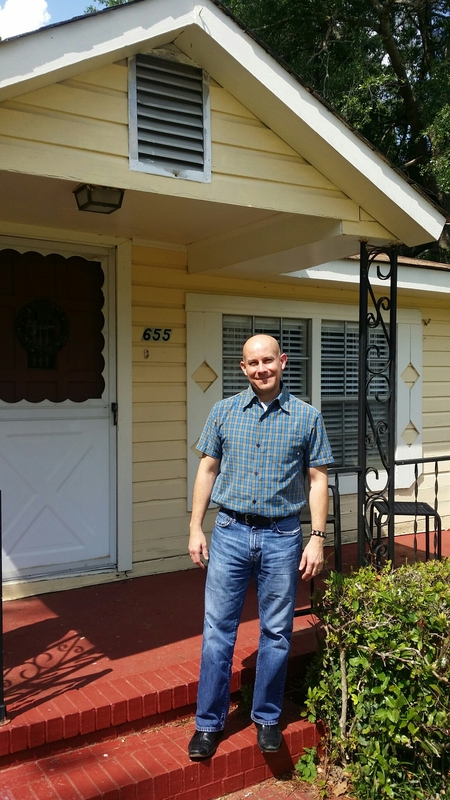 A group of justice-loving Christians in Atlanta started visiting Stewart soon after it opened. They listened to the stories of the detainees. They talked with family members who came to visit. Many drove from far away – South Carolina, New York, Texas – to visit their loved one, knowing he would eventually be deported. Imagine if your husband were about to be sent away for good – you’d want to see him. The visit is by phone through a window, so no contact is allowed, but it is better than nothing. Inmates are allowed one one-hour visit per week. The week ends on Saturday. The justice-loving Christians realized if family members had a place to stay, they could see their loved one twice before making the long drive back. 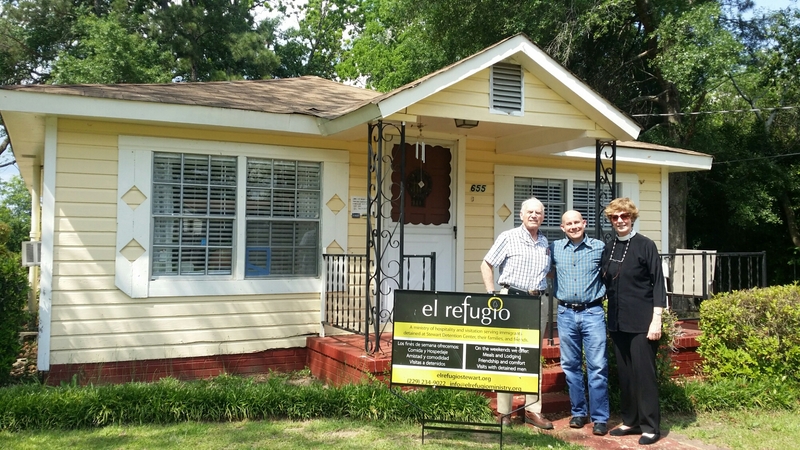 So they opened a hospitality house – El Refugio. 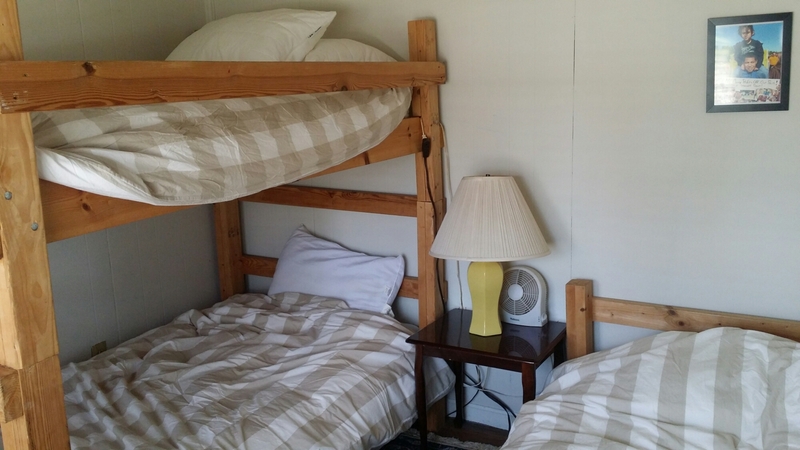 El Refugio is a very simple place – four bedrooms with lots of bunk beds. Several families can stay at a time. Site coordinators and volunteers open it on Saturdays at 10 am and close around noon on Sunday. They hang out with families who are waiting for a time to visit. They cook meals or play games with children. They provide free meals and charge no fees. Mostly, they are there to love the alien and welcome the stranger. The law of God to the Israelites was clear. The life God envisioned for his beloved people was a life of welcome and hospitality for all. They had been strangers in the land of Egypt, so they were to welcome the strangers who came among them. In welcome and hospitality they would find abundance and peace. But even though he will be deported, we can still be welcoming toward him and toward all people. It is important for Americans to treat these people well, give them opportunities to visit with their families, work through their cases quickly, and advocate for just and humane immigration laws. The people who are deported go home to tell others what we are like. I hope they will have good things to say. 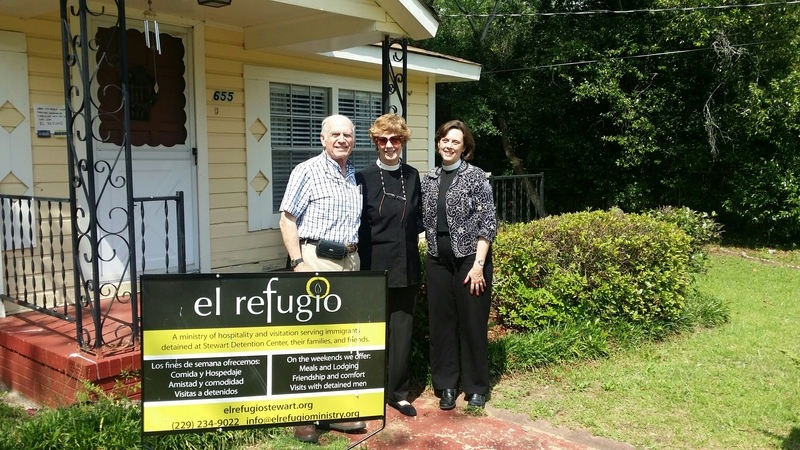 If you would like to learn more about El Refugio, visit their website here.